Surprising trends: neck contouring. Why should you contour your neck? First, we were contouring the face to make it look expressive and slimmed down. When we mastered highlighting face contours vloggers started to create tutorials for cleavage contour, to highlight bones and slim down neck. Today, Instagram is filled with totally new trend, which for now is mostly treated with curiosity – neck contouring. What is it? Why should you try it? Let’s find out. As it turns out bronzer and highlighter are great not only for face contouring, but it works also for slimming down other parts of the body. More and more women use contouring palette to test its magical abilities on parts of the body where they would prefer to have a little less. Ability to operate with light and shadow may work miracles and can enhance the woman’s beauty. How to use this most famous, lately, contouring method? 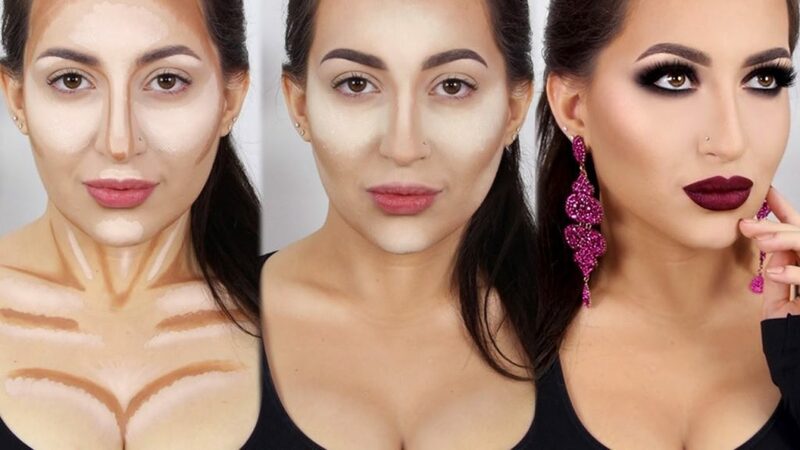 The idea for this contouring trend came from popular blogger – author of the Makeup Wearables blog. What is it all about? Lately, the girl posted the tutorial, which in one day had million views. The tutorial presented neck contouring! She showed the effects of her innovative method on her Instagram, @mwhairstyles. Her idea gained such popularity, that it caused arguments about the sense of contouring anything besides the face. The author of the film claims that in her opinion contouring has one basic goal, to slim down chosen parts of the body. Blogger decided to test this method on her own neck and try to slim it down with a bronzer and a highlighter. It is mainly used to present beautiful high hairstyle on the slim neck with help of neck contouring. Neck contouring then, by its premise, is not an everyday trend, but an additional effect for occasional nights out. The people who are against neck contouring think it is absolutely needless trend. Though, no one ever said that contouring is reserved for a face only, trends like this, with use of bronzer, cause great dispute.